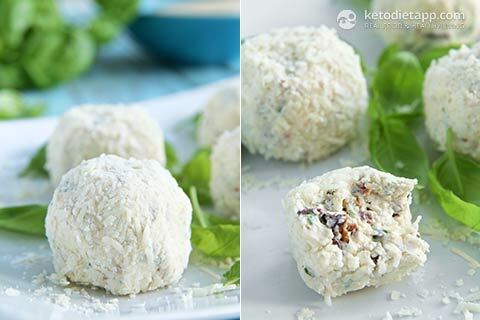 These fat bombs may look like coconut truffles but they are, in fact, another savoury recipe. 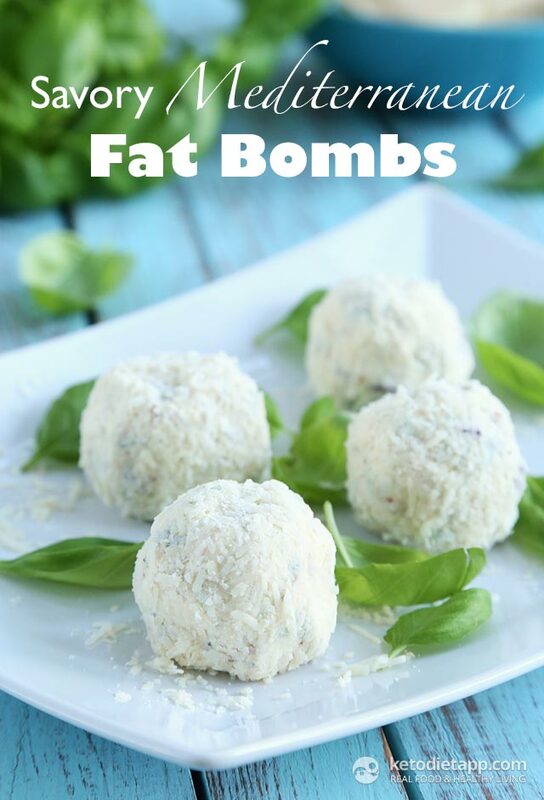 Adding freshly chopped herbs, sun-dried tomatoes, garlic and olives gives them a strong Mediterranean kick - you won&apos;t even know these are fat bombs! :-) Why use fat bombs? Have a look at my post here. 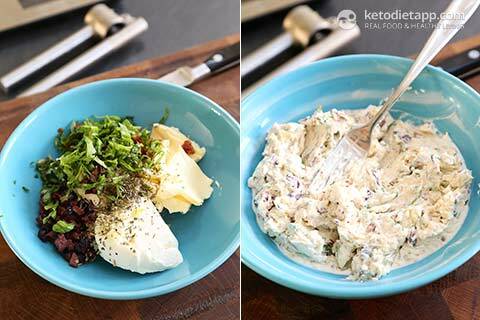 Macronutrient ratio: Calories from carbs (3.8%), protein (8.4%), fat (87.9%). 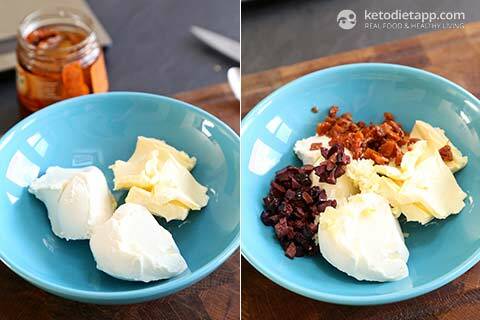 Cut the butter into small pieces and place in a bowl with the cream cheese. Leave it on a kitchen counter for 20-30 minutes to soften. Mash with a fork and mix until well combined. Add the chopped sun-dried tomatoes and chopped kalamata olives. Add freshly chopped herbs (or dried), crushed garlic and season with salt and pepper. Mix well and place in the fridge for 20-30 minutes to solidify. Remove the cheese mixture from the fridge and start creating 5 balls. You can use a spoon or an ice-cream scooper. 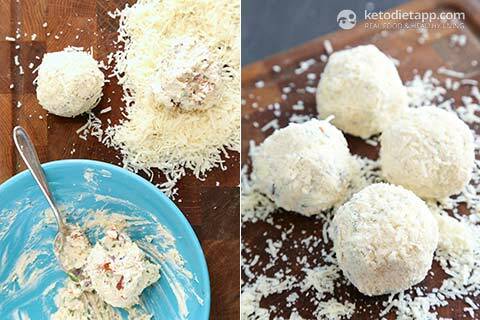 Roll each ball in the grated parmesan cheese and place on a plate. Eat immediately or store in the fridge in an airtight container for up to a week. Enjoy! why not feta cheese ? I clearly love this recipe. Thanks for coming up with something so wonderful! How many fat bombs would you use per day when trying to lose weight? Hi Hillary, that depends on how you use them. They are high in fat and can easily add up and exceed your energy requirements. They can help with weight loss if you use them in moderation as a quick source of energy, e.g. when you don't have time to cook. Do not use fat bombs only to increase your fat intake if your goal is to lose weight. These are tastey! Do you know the calories? 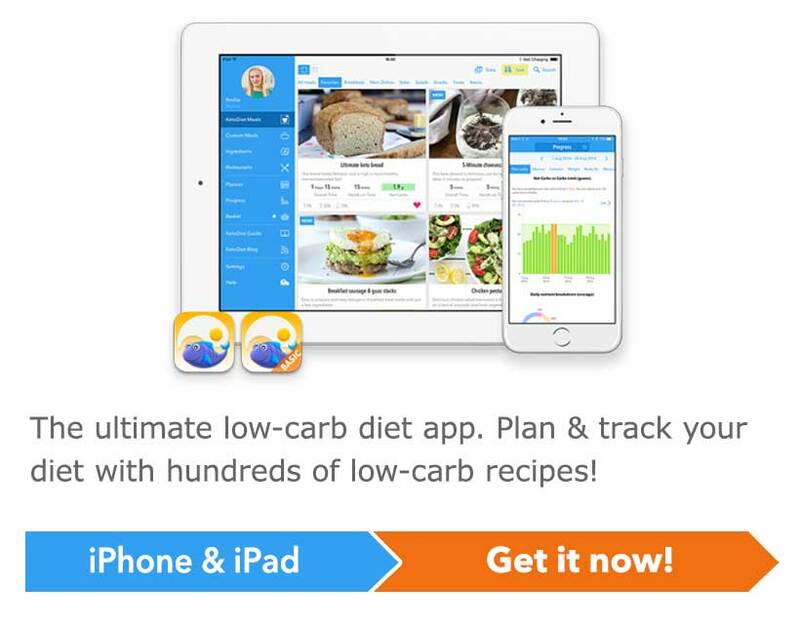 Although I understand keto diet focuses on net carbs, fat and protein, my APP I use to track my food and exercise requires a calorie measurement. Please and Thanks! Hello Debbie, calories are listed as "kcal". I hope this helps! Is it 2 tsp of each individual herb, or is it 2 tsp total herbs? Hi Kasey, it refers to total amount. I love the savory fat bombs. I've made several batches now of the Savory Salmon Fat Bombs. Love them. I love my sweet fat bombs but this was a great change of pace. Going into the rotation! Thanks! Thank you Elizabeth, hope you like them!